When it comes to visiting the Virgin Islands, sailing charters are the best option for you. There is no doubt that the Virgin Islands are one of the most beautiful charter vacation places, made of more than fifty islands and several cays in the Caribbean Sea. Boutique shopping, white sand beaches, restaurants on the water and the various dining alternatives are just a few of the main attractions of this little paradise. Opting for one of the Virgin Islands sailing charters will offer you the opportunity to explore some of the most beautiful islands, such as Anegada, Jost Van Dyke, Virgin Gorda and Tortola, in the most relaxing way. It is to be noted that aside from these places, there are also many wild, uninhabited islands known for their beauty. More than that, the Virgin Islands are never crowded since there are no direct flights from other parts of the world. In order to keep the natural aspect of the place, you will never find a building taller than a palm tree. This is an excellent family vacation for people who want to enjoy the beauty of nature. 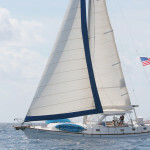 Virgin Islands sailing charters are a great choice for a relaxed vacation for both experienced and beginner sailors. As mentioned above, there are more than fifty islands, but Jost Van Dyke, Tortola Island and Anegada are the most popular of them. Tortola Island has many restaurants, yacht charter operators, shops and hotels since it is the most populated. When it comes to beaches, Brewer’s Bay, Josiah’s Bay, Lambert, Cand Garden Bay, Smuggler’s Cove and Long Bay Beach are considered to be the best. You can also enjoy hiking, scuba diving, surfing, kite boarding and more. Formed from coral and limestone, Anegada is flat and close to sea level as compared to the other islands, which are mountainous. This island is well-known for its white sand beaches and for the Horseshoe Reef, which is the biggest coral reef. At three square miles, Jost Van Dyke Island is smaller than the other two. Its main attraction is Great Harbor, which draws a lot of visitors. Soggy Dollar Bar is known as the place where the Painkiller drink was invented, while Foxy’s Bar is one of the most famous places on the island. No matter the place you want to see first, Virgin Islands sailing charters are the best option for a dream vacation with your family and/or friends.